Kannur, april 15, 2018 (IE): When he looked at his seven-year-old daughter Ameya, a pain ran through his heart. As the indignation over the savagery inflicted upon an innocent child, too tender to understand the barbarism mankind is capable of, Rajith Ram looked at his second daughter, a new-born, and called her ’....., my dear daughter!’ It was a firm proclamation of an independent mind. Soon he posted it on Facebook, and wrote below the photo of the two-month old smiling kid, "Given her the name; Yes, the same... ’..... S Raj’... She is my daughter." Responses started pouring in within minutes of the post. Rajith Ram, a Kannur-based journalist with Malayalam daily Mathrubhumi, was amazed to see the tremendous response. "The response is amazing. It is getting bigger and bigger by minute," he said. The post was shared over 15000 times on FB while the likes have crossed 26k. "As the father of a seven-year-old daughter, I felt angry and got frustrated at the events that took place even after that hideous act. That such barbaric, cruel acts still happen in our country, is a disturbing thought for a father of two girls like me. 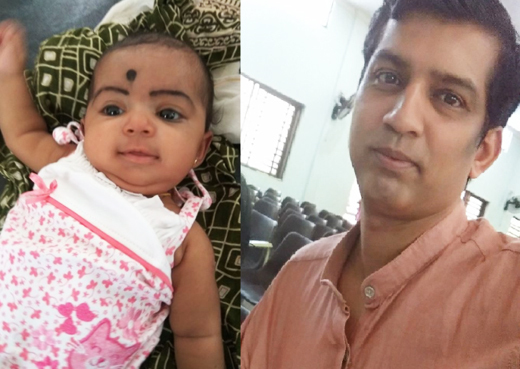 When the thought occurred to me to name my second daughter who was born on February 4, after ’....’ I discussed it with my wife Sandhya. She readily agreed to the idea," says Rajith.